A Shore Thing - casa Profissionalmente desenhado na comunidade de praia moderna espera por você. Mais de 3000 pés quadrados com 4 quartos, 4-1 / 2 banheiros - dorme 12. Três (3) níveis têm vista para a piscina da comunidade adjacente. Nosso calçadão para a praia é agora carrinho de golfe acessível. 2 suítes master com banheiros privativos. Todos os quartos abrem para um deck. Excelente vista da piscina comunidade adjacente à casa. Softner água em toda casa. Comece o dia com o café na marquise. Passe o dia na praia com uma curta caminhada através calçadão privada. Termine o dia relaxando com sua bebida favorita e desfrutar o pôr do sol com seus convidados! Uma excelente vista com enormes plataformas em cada nível. O 1º andar desta casa de praia dispõe de quartos com cama de futon e banheiro privativo completo. E elevador de acesso para ajudar com seus mantimentos! Adicional geladeira tamanho completo na garagem para guardar bebidas para a praia. Grade de propano e cadeiras de praia. O segundo andar possui 3 quartos grandes de hóspedes: um quarto principal com cama king size e banheiro privativo, um quarto de hóspedes com cama queen size e 3 º quarto com 2 camas de tamanho. Common casa de banho completa. Todos os quartos no 2º andar abre para um amplo deck coberto para sonecas ou áreas de socialização separados! Lavanderia com lavadora e secadora. O 3º andar tem uma vista de tirar o fôlego durante o dia e à noite a partir do convés aberto. "Ver os navios de rolar dentro". Este andar tem a suíte master com casa de banho privativa e exclusiva marquise. Entreter seus convidados com grande cozinha aberta e sala de estar. As características vivas da área 2 grandes sofás e cadeira para desfrutar de música e filmes. Sistema de Som Surround de entretenimento com sistemas de som prolongado aos 1º e 2º nível pavimentos. Bela sala de jantar acomoda confortavelmente 8 e pequeno-almoço bar lugares mais quatro. Desfrute de conversas em torno da mesa de jogo. Subir um pequeno lance de escadas do 3º nível é o Lookout Room com TV LCD e conexões para jogos e mídia junto com 3 cadeiras que se dobram para camas de solteiro. Softner água em toda casa. Third year in a row to stay here. Love it! Beautifully decorated and spacious. Well stocked. Great home and we will book there again! The house was beautiful and lived up to expectation. This beautiful house was everything we hoped for and more. It was big enough for everyone to have privacy as well as lots of space for gatherings. The kitchen was fully equipped and had everything we needed to prepare meals. The decks are amazing and was a favorite place to hang out. We really loved the benefit of having the elevator for carrying luggage and groceries up to the third floor. The beach is an easy 8 minute walk from the house and the pool is right next door. Our entire family loved this beautiful property and are already planning our next vacation at A Shore Thing! Shore thing = Sure thing! Our family of four (two teenagers), in-laws, and brother-in-law stayed here early July and there was plenty of room for everyone. Beds were comfy, kitchen had everything we needed, family room was roomy for evening games, and any porch you picked to sit on was amazing. It is a leisurely 8 min walk from front door to having your feet in the water. Port Aransas has several good restaurants to choose from and you can see the community coming back from last years storm. Definitely would recommend this house. Only negative (which has nothing to do with the house) was the community pool. It looked to be serviced once a week which is not often enough for the amount of kids and families that enjoy it on a daily basis. Towards the end of our stay, it was looking murky green, had the film floating, etc.. The pool and its proximity was a major decision factor for us, so that was the only part that was subpar. Rosie communicated great, and I highly recommend booking this house in Port Aransas. 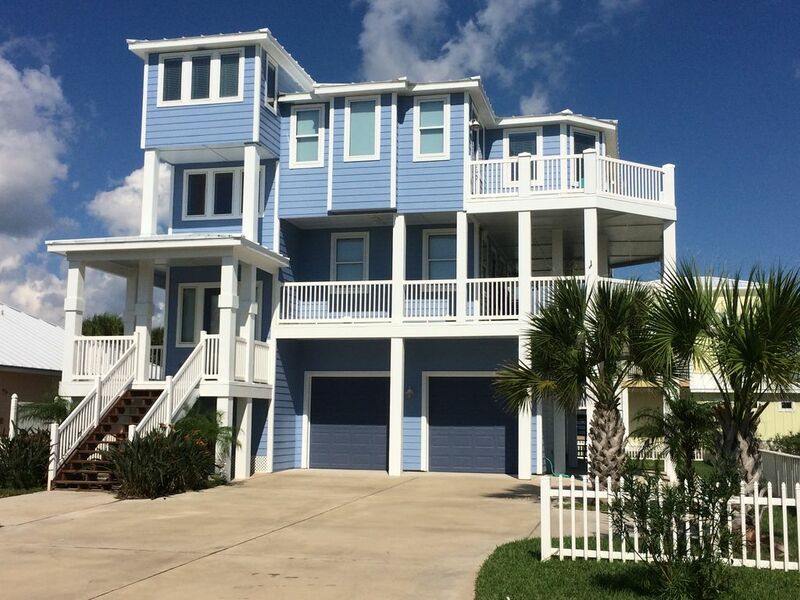 We haven't stayed in Port A for over 10 years and have never rented a beach house. It is a very large house with extra space for people to escape to. There was only 7 in our party and everyone had a great time. Having the pool next door is a definite plus. The kitchen was well stocked and had all the tools and utensils we needed. It is a very nice subdivision and was very quiet. There are a few signs of aging and some wear and tear but overall it was a great stay. The only knock is all the stairs. Even with the elevator, we were constantly going up or down stairs to get between floors. I only mention it for those with very young kids or those that have difficulty with stairs. Definitely recommend renting a golf cart for the trip to the beach. Thank you George for your review! Many mention how big the house is and enjoy the extra room, especially have private areas to escape when they want to. We make sure the kitchen is fully stocked and know that is a plus as so many comment on it. Come back as often as you can! must for my husband and I and came in handy. Our family loved the balconies at night and during day for gathering and talking about the day. We rented a jeep and drove to beach not sure if golf cart could access boardwalk. Loved the outdoor shower and hoses for rinsing all the sand off us and beach stuff. We had a bit of trouble with TV turning off every 30 minutes. The owner returned text but we were out so couldn't work on it. Overall house is well decorated and plenty of room so folks have private time to relax. Great House. Thank you Lisa for you nice review! We love for families to come here and enjoy their time and go back with great memories. The house does provide plenty of room and little something for everyone of all ages. Enjoy the rest of your summer and we hope to see you back soon!